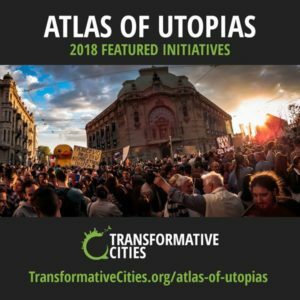 The atlas features 32 communities from 19 countries who responded to TNI’s Transformative Cities initiative which seeks to learn from cities working on radical solutions to our world’s systemic economic, social and ecological crises. What is the purpose of this Atlas? The project is by no means a comprehensive mapping of transformative practices, but it nevertheless showcases inspiring stories of communities challenging entrenched power and boldly developing alternatives. These range from small villages in Bolivia to international cities like Paris that have defeated multinational corporations and hostile national governments and delivered democratic, people-powered solutions on water, energy and housing. In the coming weeks, Transformative Cities will be exploring nine case in more depth and then inviting you to vote on your favourite. Our goal long-term is to learn from and with the communities on what delivers radical transformation at local level in terms of power relations and social and ecological justice. Please read the stories and share your favourites with your networks via email, social media or word of mouth. Utopia lies at the horizon. When I draw nearer by two steps, it retreats two steps. If I proceed ten steps forward, it swiftly slips ten steps ahead. What, then, is the purpose of utopia? It is to cause us to advance.